Asphalt degrades over time and consequently needs regular care in order to maintain its worth and to lengthen its useful life. 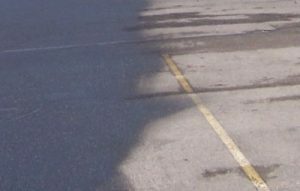 The conditions that lead to asphalt failure of parking lots in North Carolina are: oxidation from sun, water, salt used during the cold season, automotive fluids and damage from traffic. The effects of these variables are weak and bleached asphalt which is likely to produce potholes and cracks. Though we like to think of roads and parking lots as these indestructible and long-lasting things, they’re just as susceptible to damage as anything else. The most damaging thing to your driveway or parking lot is the usual suspect, mother nature! On average, a parking lot will last you for about 25, maybe 30 years. This may seem like a long time, but the asphalt starts to age as soon as its laid. Eventually, your parking lot will need to be repaired, that’s inevitable. Does your businesses’ parking lot have a lot of extremely unsightly pot holes or cracks? Not only are these a terrible eye sore, but they give off a bad impression to customers. If you can’t even maintain your parking lot how can you be expected to provide quality service to your customers? Some people truly are immediately turned away by visual things like that, they only want to do business with people that seem to really care. Nip all of that in the bud and save yourself money in the long run with a good seal coating for your YOUR asphalt! Just one of our Triangle parking lot services. Potholes are not a good thing to have in your parking lot, they’re an eye sore and more importantly a safety risk. This holds true for any damage to your parking lot. Potholes can cause injury to driver and car alike, a little pothole is capable of much more damage than it looks like it can do! A pothole can be caused by contraction and expansion of the soil under your parking lot or driveway, due to changes in weather usually. Now, as water seeps down in your potholes, it too will freeze and thaw! Over time this can weaken large areas of your parking lot, eventually causing them to just crumble apart. Areas around the pothole will continue to get weaker and break down – the last thing you want is damage that you can’t see until it’s too late. If pooling water is the issue, it would be worth looking into better drainage rather than resurfacing everything, it could be an easy solution to a potentially horrible issue! Sealcoating applied to an asphalt parking area provides an effective barrier or seal between the elements above the sealcoating and the asphalt surface below it. Below the surface the sealcoating stays on the moist side which makes it pliable and as a result, resistant to cracking. The main reason that your asphalt does crack is from torsion and movement, it just doesn’t have the playability to withstand such things. Seal coating will not only refurbish your parking lot, it will make it last much further into the future! 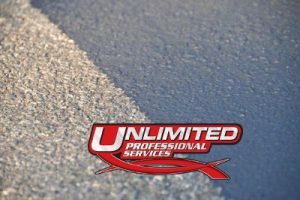 Unlimited Professional Services offers sealcoating services to asphalt parking lots in the Triangle region of North Carolina. We provide sealcoating parking lot services to commercial and industrial customers, and we specialize in sealcoating parking lots and commercial driveways. When you call Unlimited Professional Services for sealcoating, you are calling the best in the business. 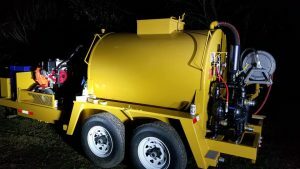 With our years of experience and know-how, you can rest assured that your blacktop will be sealed with a high quality, long lasting asphalt sealer. Most local companies would probably outsource a big job like refinishing a parking lot – but not us. We have all of the tools and experience we need to get the job done for you, in house. When it’s time for maintenance and upkeep of your parking lot, call the pros at Unlimited Professional Services. In addition to sealcoating asphalt, we line-stripe parking lots, asphalt lots of all kinds, curbs, do pavement marking, and more. Not only does our blacktop sealer lengthen the life of your parking lot, driveway or sidewalk, it also makes it look nicer too! Sealcoating your parking lot is one of the best ways of keeping out water and reducing the chances of costly repairs and earlier than necessary resurfacing. We finally have the equipment to do this work ourselves, and we couldn’t be any more happy about it! Now we can totally ensure that we are doing 100% quality work for all of our customers every time. 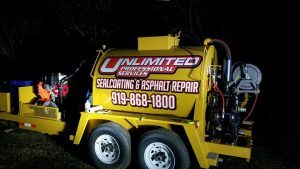 With our new asphalt sealer, we can conquer any job you may have, none is too big or too small. We can be out on the job in as long or short of a time as you may need.